Hello mommies, I read your comments and you ladies are so strong and amazing . I am 8 weeks pregnant with twins myself..
We go tomorrow to see if the twins are MoMo, the OB thinks they are but we are confirming. I am so very curious since this is such a "rare" occurrence and I am seeing it so often lately how many of you amazing ladies with MoMo pregnancies received the Gardasil vaccine? My daughter did against my wishes when her step-mother made her go the summer she lived with her father. I was mortified because there isn't enough long term evidence on the effects of this drug and the curiosity is just killing me as to whether or not Gardasil is any link. Praying for you all. my son and his wife are expecting Mo/mo twins and they are pretty worried. Momo twins are 1 egg split they share the same sac and the same placenta. They account for only 1% of pregnancies. They are very high risk due to possibility of cord entanglement and TTTS. I am 10 wk 3days with momo twins. There are 3 kinds of twines didi (fraturnal) 2 eggs 2 sperms. mono di (identical) 1 egg 1 sperm that splits and become 2 but haves 1 placenta for both baby's, baby's are in one big sac with 2 small sacs for each of the baby. Mono mono (identical) 1 egg 1 sperm that splits and becomes 2 but has 2 placentas one for each baby and they are in one big sac. 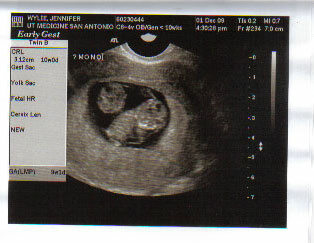 I am 12w 2d with mono di twins. After speaking with my doctor and him explaining what they are I researched on the Internet and found out a lot on twins. That is a short way of explaining it if u want to find out more just google it's a persons best way of finding out info. Did you see two heartbeats at your first u/s?